The two near sister Reichel/Pugh designs Alan Brierty's Limit and Stephen Ainsworth's Loki, finished first and second, just one point apart, in the Rolex Trophy Rating Series regatta, the major warm-up for the Rolex Sydney Hobart race which starts this Saturday, December 26. The close competition between these year-old, well-settled, professionally-campaigned yachts, establishes them as among the top contenders for the Hobart race's major prize, the Tattersall's Cup for the overall winner on IRC handicap. Both are Sydney-based, from the Rolex Sydney Hobart Race's host club, the Cruising Yacht Club of Australia. Limit is 63ft in length overall, Loki is 62ft, by virtue of a more plumb bow profile. Limit's crew includes Volvo race and America's Cup veterans Ian ("Barney") Walker as principal helmsman and Rodney Keenan as tactician. Loki has Irish-born international sailor Gordon Maguire as sailing master. Maguire, who lives in Sydney, has sailed in 15 Hobart races. The Rolex Trophy Rating Series, over four days of racing, tested boats and crews in broad spectrum of conditions. The first two days of short windward-leeward course racing, were gear-busting and body-bruising, with winds of 25-28 knots and rough, confused seas off the Sydney coastline. The small fleet of grand-prix racers contesting the rating series were joined for the last two days by a fleet of 26 more yachts, ranging in size from the maxis Alfa Romeo (Neville Crichton) and Investec Loyal (Sean Langman) down to 30-footers, in the Rolex Trophy Passage Series of two races over 27nm and 19nm offshore courses. Also emerging with Tattersall's Cup-winning prospects from this mix were the Judel/Vrolijk TP 52 Shogun (Rob Hanna), which placed third in the Rolex Rating Series and the three place-getters in the Rolex Trophy Passage Series: Geoff Ross' Reichel/Pugh 55 Yendys beat the UK-based Judel/Vrolijk 72 Ran (Niklas Zennstrom), with veteran Sydney racer Syd Fischer's Farr designed TP52 Ragamuffin in third. Neville Crichton's Reichel/Pugh 100, Alfa Romeo won the first race of the passage series by more than 12 minutes on corrected time. As the maxis can do in the Rolex Sydney Hobart, Alfa Romeo got a huge jump on the smaller boats in a changing light air wind pattern. She reached all the way on one leg to the seaward mark and back before the wind shifted from west to south-southeast, giving the rest of the fleet a much slower dead downwind ride back to the harbour. Alfa Romeo did not compete in the second passage race, preferring to spend the time on sail evaluation and crew training. In the Rolex Rating Series, Limit and Loki, went into the last race tied on equal points. Limit, badly beaten the previous day after a crew error jammed the furling system on its Code Zero reacher, made no mistakes this time. "We went out an hour and a half early at the owner's orders and we trained, and we trained until we got it right and we fixed the problem," said principal helmsman Walker. Limit had a good start and led Loki, who was boxed in by a bunch of boats congregated at the committee boat end of the starting line, on the outward leg to the seaward mark, and rounded seven minutes ahead. Loki, gained on the light-air run back to Sydney Harbour to finish just over two minutes behind Limit. 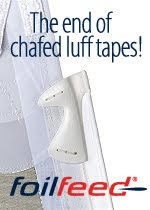 They finished second and third on corrected time behind Michael Hiatt's Farr 55 Living Doll, sailing the perfect race with UK-based Australian Volvo Ocean racer, Andrew Cape, navigating. Despite the last-race win and a third in the first race, Living Doll, another Tattersall's Cup prospect, did not make the podium - retirements due to sail mishaps from two races on the rugged first two days of the Rolex Rating Series stuffed her chances. Limit's owner Alan Brierty, puffing a cigar as he sat on the rail said after the last race: "A little bit nerve wracking. We got a good start and it's the old story when you get in front you've got to stay in front. Barney was sensational". Barney Walker is pleased with the way Limit's campaign has come together, sharpened by the boat-on-boat competition with Loki. "When you've got two boats that are so close you really get the best out of them, and having that second yacht there does really keeps you honest," he said. Loki's owner Stephen Ainsworth has a similar perspective: "We enjoy racing against each other because it's closely contested and we've learned to sail our boat better by racing against them." Third-place Rolex Rating Series skipper Rob Hanna, from the strong Victorian offshore fleet, was competing on his Judel/Vrolijk TP52 Wot Now, a boat he had only purchased last month. 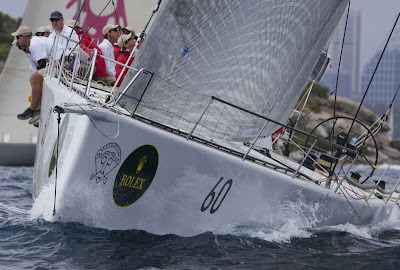 But Wot Now has a good track record in the upcoming Rolex Sydney Hobart Race, finishing third overall in IRC in the 2008 edition. His crew, including Sydneysiders tactician Steve McConaghy and helmsman Sean Kirkjian, added to Hanna's Victorian regulars, had not raced the boat before the opening day of the Rolex Rating Series. "The boat's fantastic and this has been a great learning curve so far," said Hanna. 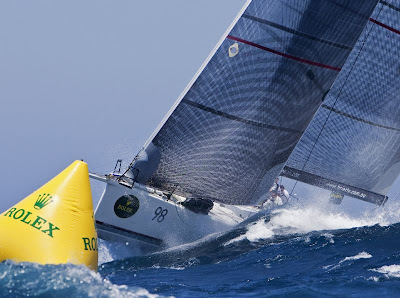 A fleet of 100 yachts will compete in this year's race, which starts at 1300 AEDT, 26 December 2009. The Rolex Sydney Hobart fleet will have crews representing the USA, UK, New Zealand, Spain, the Netherlands, and New Caledonia as well as every Australian state.